Graduate students honored with the Excellence in Teaching Award are (from left) Luke Ayers, Brett Remkus and Inci Ruzybayev. 12:09 p.m., May 9, 2012--Seven members of the University of Delaware faculty have been recognized for outstanding work in teaching and advising, and three graduate teaching assistants have received awards for excellence in teaching. 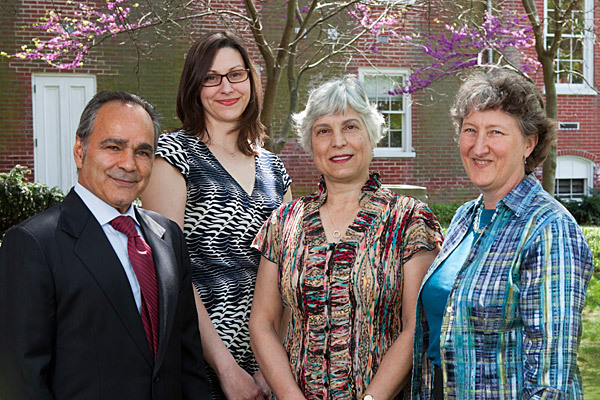 The Excellence in Teaching and Excellence in Undergraduate Advising and Mentoring awards were presented at the May 7 meeting of the Faculty Senate. 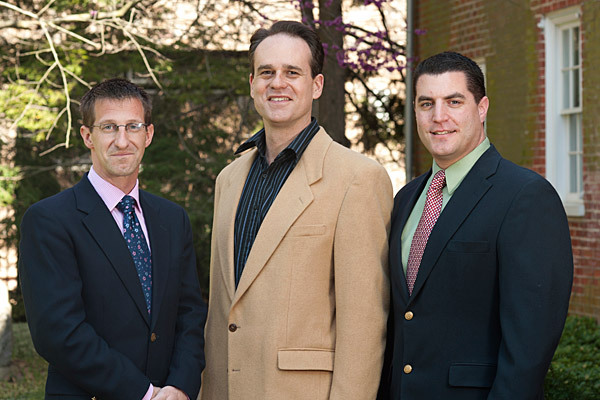 This year's Excellence in Teaching Awards were presented to James Atlas, assistant professor of computer and information sciences; Steven Mortenson, associate professor of communication; and Matthew Weinert, associate professor of political science and international relations and director of graduate studies in the department. Honored this year were Vicki Cassman, assistant professor of art conservation and director of undergraduate studies in the department; Lindsay Hoffman, assistant professor of communication and of political science and international relations; América Martínez, assistant professor of foreign languages and literatures; and Ali Poorani, associate professor of hotel, restaurant and institutional management. 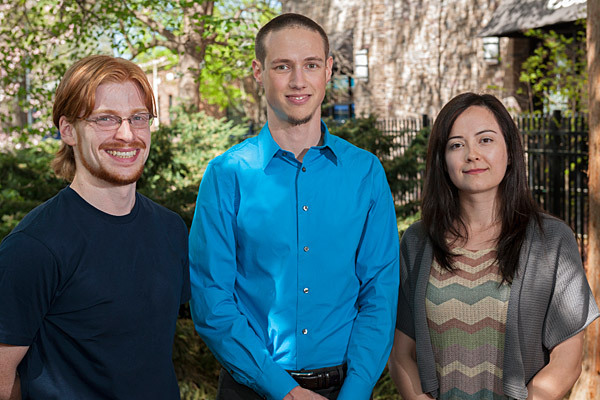 Each recipient of the graduate student Excellence in Teaching Awards receives $1,500. This year's honorees are Luke Ayers, who is pursuing a Ph.D. in behavioral neuroscience; Brett Remkus, a doctoral student in the Department of Political Science and International Relations; and Inci Ruzybayev, a Ph.D. candidate in the Department of Physics and Astronomy. UDaily asked this year's honorees to share their thoughts about teaching and advising. Excerpts from their responses are printed below. To read their complete responses (PDF), click on their names. James Atlas: "I place a special emphasis on a hybrid approach to engage students in lecture by mixing traditional lecture format with active learning techniques including self-reflection, pair programming, peer critique, kinesthetic activities, outreach experiences and problem based learning. Because students respond differently to various teaching styles, I use several of these techniques in the same course through the semester to broaden participation in class." Steven Mortenson: "Empowerment is the primary goal that fuels the way I teach and study communication. I strive to help students understand that human reality is constructed both socially and linguistically. The more people understand how communication produces the social reality we live in, the more empowered people become in defining their own reality." Matthew Weinert: "Several years before I began to teach, I encountered a statement written by Hannah Arendt, one of my intellectual heroes: 'Education is the point at which we decide whether we love the world enough to assume responsibility for it...[and] to prepare [students] in advance for the task of renewing a common world.' Once I began to teach, I found myself always coming back to the duties entailed in that statement: How best do I assume responsibility for conveying information, teaching skills, inculcating an ethic of responsibility and instigating a love of learning?" Vicki Cassman: "A field such as art conservation requires extended preparatory studies and often I advise for several years beyond graduation. I have an open door policy, and present and past students regularly pop in for advising or a quick question. Our website and email are important tools, but face-to-face interactions are vital." Lindsay Hoffman: "My philosophy of advising focuses on mentoring students through the research process. It's easy for scholars to become entrenched in a specific discipline's discourse, and undergraduates can often open our eyes to new ways of examining both old and new issues. A commitment to open dialogue produces not only a one-time learning experience, but potentially ground-breaking research." América Martínez: "My goal when advising students is make sure that every student who comes to see me leaves my office knowing that they have the answers they needed -- if not precisely the ones they were hoping for -- and that they have been correctly advised; that they have been listened to and that they have been treated with respect; that their concerns have been taken seriously; and that they are important as human beings and students at UD." Ali Poorani: "Beyond academics, our students have a multitude of other needs, such as professional and leadership development, industry networking, connection to social groups and emotional support. Understandably, no faculty mentor/adviser can possibly attend to all wishes for all students, but he or she can: Encourage, Empower and Engage students to fulfill those needs." Luke Ayers: "I believe that learning is an individual process best achieved through repeated active engagement with the material. My goal is to get students to teach themselves the material in a way that makes sense to them, using means they typically don't explore such as drawing. I only provide a foundation and guide their learning." Brett Remkus: "I believe that the most important thing that I can do to help the students in my class is to be available. I frequently offer to meet students on Skype in order to discuss problems they may be having in class. This is an option that has worked very well…. I also try to give lots of feedback on writing assignments, especially since I think that improving writing skills should be one of our first priorities in the classroom."